The soul of the game resides here! The game of golf was born on rugged seaside land just like this. Every hole, every hazard, and every shot is defined by nature’s infinite presence. As the elements change, so does the game. It’s all part of the tradition of links golf. Ceibo Valley Golf Club at Las Olas was created by nature and will be refined by golf course architect Kris Savignac. Mr. Savignac’s resume includes working closely with Pete Dye on such projects as The Ocean Course at Kiawah Island and Jim Fazio on Donald Trump’s world-renowned Mar-a-Lago. This eighteen hole world-class golf course, where expansive ocean views are revealed on nearly every hole on the back nine, has been carefully designed for players of all skill levels. Whether you are a beginner, a hardened golf warrior or just out for an enjoyable Sunday afternoon round of golf, The Links at Las Olas will be built for you. The clubhouse will be located 1,500 meters from the ocean, built on the side of a mountain, the design boasts two restaurants, a gym, meeting and conference rooms, and a fully staffed pro shop. The most spectacular feature of the clubhouse will be the view that overlooks the back nine with beautifully sculptured greens leading to the sea beyond. The front nine is located furthest from the ocean and is played through a combination of rainforest, mountainsides and valley floors. Four of the tee shots are elevated and provide the golfer with wonderful views of the countryside. Multiple tee blocks allows the player to choose the distance and challenge of their liking. The fourth hole is a par three with both the tee block and the green situated 150 feet up the side of a cliff. The seventh hole is a short par four which challenges the golfer to make a choice on route to the green. Hit it over the large Ceibo trees guarding the green, which is bordered by a vast ravine or lay up for a short approach shot. The eighth hole will be one of the most revered holes on the course. The back tees are located some 300 feet above the fairway, the ocean can be seen off in the distance, and below, on the valley floor the fairway is surrounded by rainforest and wildlife. 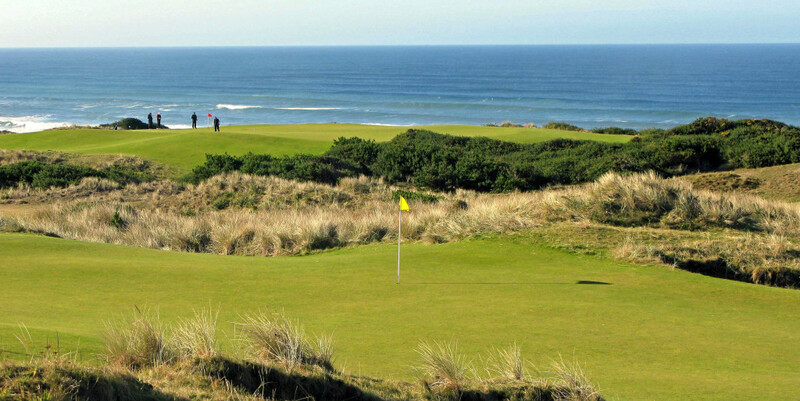 The back nine enjoys ocean views from most holes playing down to the ocean and back. The par five fourteenth hole is a true test of golf with a ravine playing down the entire left side and the long narrow green surrounded by water on three sides. If you thought keeping your head in the game was hard on the fourteenth hole, the ocean behind the fifteenth hole promises to be even more daunting. The par three fifteenth tee shot is carried over the river to the green located virtually on the beach. In fact, fly the green and you will be forced to play your second right directly from the beach. While most holes have alternative routes to avoid forced carries, there is no alternative when it comes to the eighteenth green. The par five approach requires all golfers to carry a natural ravine to reach the green. The ravine plays down the entire right side of the hole and the gentle ocean breeze is normally to your back to this great finishing hole. The outstanding practice facility will truly be the best in all of Ecuador. The practice facility includes a full practice range, a practice green, and short game chipping and bunker area. It is also highlighted by an executive Par 3 course to either work on your iron and short game, warm up prior to your round, or to settle gentleman’s bets after the round.